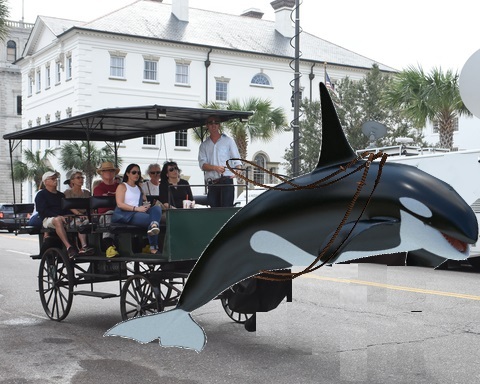 Bowing to pressure from local animal activists, several downtown Charleston carriage tour companies have decided to change their source of locomotion from draft horses to killer whales. For the past decade, protesters have complained that having horses, oversized mules, and the like have had to pull fat Ohioans through Charleston’s quaint historic streets, no matter the weather. But now, many of those carriages will be drawn by out-of-work Orcas on loan from Sea World. Rutledge added that because there were no hills in Charleston, and no tours going over any bridges, the Orcas would basically be “living a life of luxury … and minced krill.” Future plans would include cladding the Orcas in a suit of solar panels to collect power for resale to the state’s utilities.